It was a very busy week in upfront land with AMC, E!, Hallmark, truTV, Spike and all the Scripps Networks (HGTV, Food, Cooking Channel, DIY and Travel) all announcing their offerings for the upcoming seasons. Here are our choices for the cream of the crop. While AMC has a slew of new offerings, that may end up rivaling current hits (and some of our TV favorites) The Walking Dead, Breaking Bad and Mad Men, it's hard to imagine any of them surpassing these shows. And frankly, none of the descriptions have us jumping up and down. But one new offering, a take off on a current show sounds like a must see. Just like The Walking Dead has The Talking Dead, AMC is going to have Talking Bad, a live show that airs after Breaking Bad to analyze the series' final eight episodes. We're also slightly intrigued by the concept of The Wall, set in 1960s Berlin — Mad Men meets espionage. And just because it sounds too cheesy to pass up, we know we'll tune in to at least one episode of All-Star Celebrity Bowling. We all have one, the house in the neighborhood where people stop an ask, "Does someone actually live there?" Now PSike is going to tackle that problem house one neighborhood at a time. In Property Monstrosity neighbors will offer to fix up the disaster house on the block, as long as the owners leave while the renovations take place. We used to hate anything remotely scary, but now that we've survived two seasons of American Horror Story, we actually crave a bit of the macabre. So we curious about truTV's new show Panic Button, which places contestants in haunted houses and challenges them not to press the panic button to get out. We are admitted HGTV, Cooking Channel and Food Network junkies so it's no wonder the Scripps Upfronts yielded our most anticipated shows so far this season. In Giving You the Business owners of well-known food chains will watch employees undercover and award someone a franchise opportunity of their business. The Cooking Channel is bringing us Donut Showdown. It's pretty self explanatory and do we need a reason, really? DIY is bringing Vanilla Ice to the land of the Pennsylvania Dutch in Vanilla Ice Goes Amish. 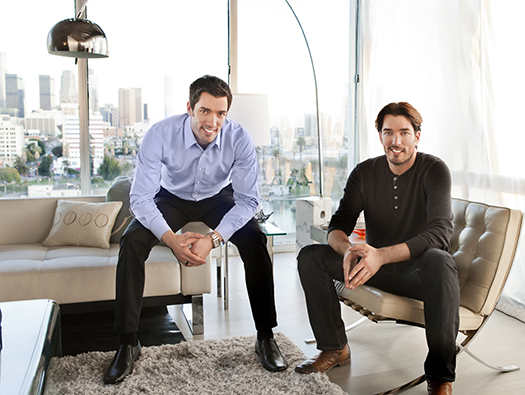 And our most exciting news from the Scripps Upfront was that the Property Brothers, Drew and Jonathan Scott, and back with yet another show, Brother vs. Brother. This time they go head-to-head metering teams on home improvement experts going after a $50,000 grand prize. Stay tuned for more from the Upfronts as the season progresses.